This month’s Columbia Journalism Review (CJR) focuses on the role of the media in the credit crisis stock market and economic collapse. My interest in this area goes back a long way; its the reason why I did the media panel at TBP. Its very interesting criticism, and worthy Sunday reading. “Without facts, the public is powerless. With them, well, it can lick Countrywide and Goldman Sachs put together. In his book, Liberty and the News, Lippmann wrote: “Everywhere today men are conscious that somehow they must deal with questions more intricate than any church or school had prepared them to understand. Increasingly, they know they cannot understand them if facts are not quickly and steadily available.” Without them, he says, there can be no liberty. 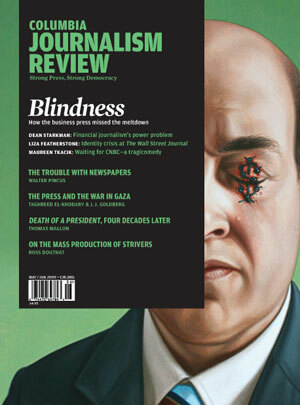 “The worst recession most americans have seen has accelerated a full-bore depression in the industry of journalism. About 12,000 journalists have joined the unemployment statistics since January 2007 by CJR’s count; in the business universe, fifty-five weekday standalone business sections have died since the fall of 2007, most recently at The Fayetteville Observer, along with nineteen once-weekly sections, according to Chris Roush, who teaches journalism at the University of North Carolina at Chapel Hill. March 14, 2012 Has the business press failed the public trust?